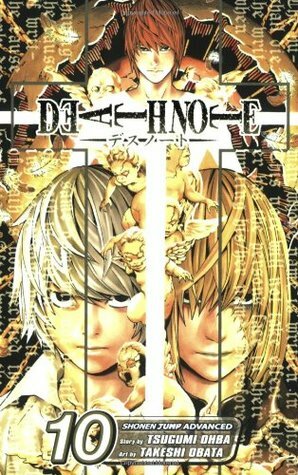 Only two more volumes of Death Note after volume 10! As much as I like this series, I'm ready for it to end. The main problem is that I don't like any of the characters anymore. Light is far too arrogant. He's always been that way, but as the walls are closing in, he's becoming darker and even more manipulative. The only truly nice person in the series, Light's father is now dead. Light seemed more upset that his father didn't confess Mello's name before he died. Light treats Misa just as heartlessly as he does everyone else in his life (although Misa is so stupid that I don't feel too sorry for her). Near and Mello are both formidable foes to Light. By the end of this volume, they've both concluded that Light is Kira although they don't have proof yet. Near is essentially L junior while Mello is darker. Neither captures my heart the way L did. When L died (I'm still hoping he's secretly alive), I realized that he truly was the character I liked most. Just two more. It's an endurance game now. Aww, I'm sorry you're not enjoying this one as much as I did. I couldn't get enough. I'm about 6 more volumes until Boys Over Flowers is done. I'm going to miss it. That's me whenever one of my favorite characters die. Denial, denial. But to be fair, authors seem to enjoy brining them back from the dead so I can never take a death seriously. I've actually only watched the anime. Kept telling myself I'd read the manga soon, but I can see how after L dying it pretty much became a different manga. As if things are not hard enough replica handbags for the Cat Cultists, it is at this moment that the Dogosians (or whatever they're hermes replica called again) make their move. They have advanced weaponry, of course, since they are an advanced alien civilization as well, and the fendi outlet Dog Leader also seems to have a squad of her own robots to deploy. Aoi, Manami and the Assistaroids get on board the ship rolex submariner replica, and start doing major damage to it. The eyepatch maid, Commander Sara, decides to personally go out to stop them. Unfortunately for her, the one enemy she comes into contact with is gucci replica neither one of the girls nor one of the armed Assistaroids, but instead one of Elis' cute ones, who was brought along as a electronic warfare unit. Sara has a weakness for cute things and cats, so instead of shooting it, she hugs it. In the meantime, Elis and Kio have not been entirely idle: Kio has put on Elis' power suit, and since he has no "mating season" the suit is now functioning normally, and they can escape from their room. Aoi, in the meantime has disabled the reactor on the belts replica ship, so that should be the end of the things, but the combat Assistaroids, during their sweep of the ship, have come upon the Dogs. It's not easy for Aoi either, as she is attacked by a woman wearing a powered suit that is just like hers. Except now we learn that the powered suits are Dog technology, and so Aoi is unable to use its powers against a Dog. Aoi does, however, manage to disable her opponent's suit (as she knows all about the suits' powers and weaknesses, and tries to escape. The Dog Leader, however, manages to hit her hard, and it doesn't look very good for Aoi.